Many comicbook fans and critics continue to regard the 1980s as something of a Golden Age on the British scene. The medium was at the height of its popularity, with several competing publications on the shelves every week, and a whole gamut of talented British (and Irish, American and Canadian) writers and artists employed with salaries they could actually make a modest living from, and more importantly a level of recognition both from publishers and readers that was hitherto unprecedented. Perhaps the most prestigious of these comic titles was Britain’s long-standing Sci-Fi and Fantasy weekly ‘2000AD’ and its legendary ‘alien’ editor-in-chief, ‘Tharg the Mighty’. A veritable nursery school for those who were to become the most important names in the comics’ industry in the decades to come, 2000 AD fostered some of the greatest creative teams and stories that had been seen so far. Writer Pat Mills and artist Kevin O’Neill brought forward the dark and dystopian ‘Nemesis the Warlock’ (1980 – 1999) , veterans John Wagner and Carlos Ezquerra created the post-Apocalyptic ‘Strontium Dog’ (1978-2010), while Alan Moore and Alan Davis showcased their talents in the anarchic fan-favourite ‘DR and Quinch’ (1983-1987). 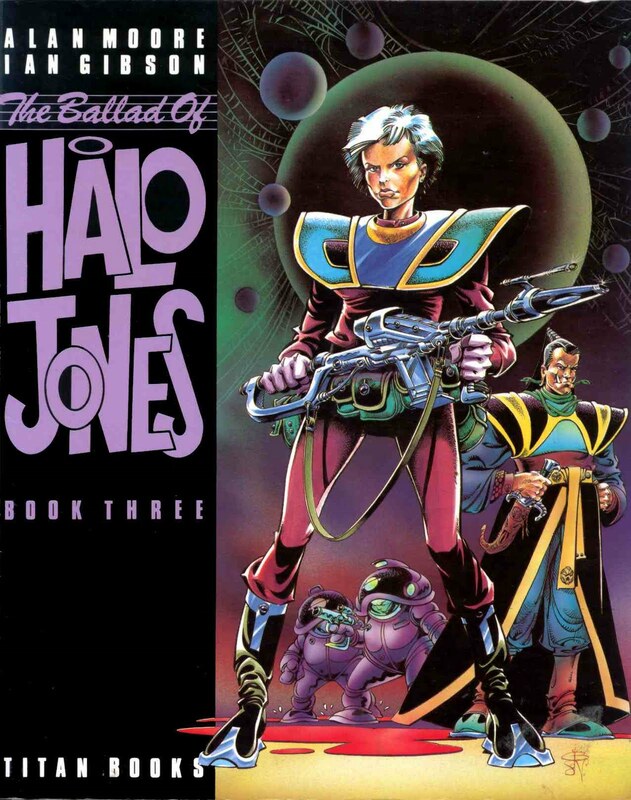 However one of the most celebrated stories (and characters) of the decade was undoubtedly to be found in ‘The Ballad of Halo Jones’, again from the imagination of Alan Moore but this time in collaboration with the acclaimed illustrator Ian Gibson. The result was a female anti-hero whose adventures and their premature end gained an almost legendary status that has lived on to this day. 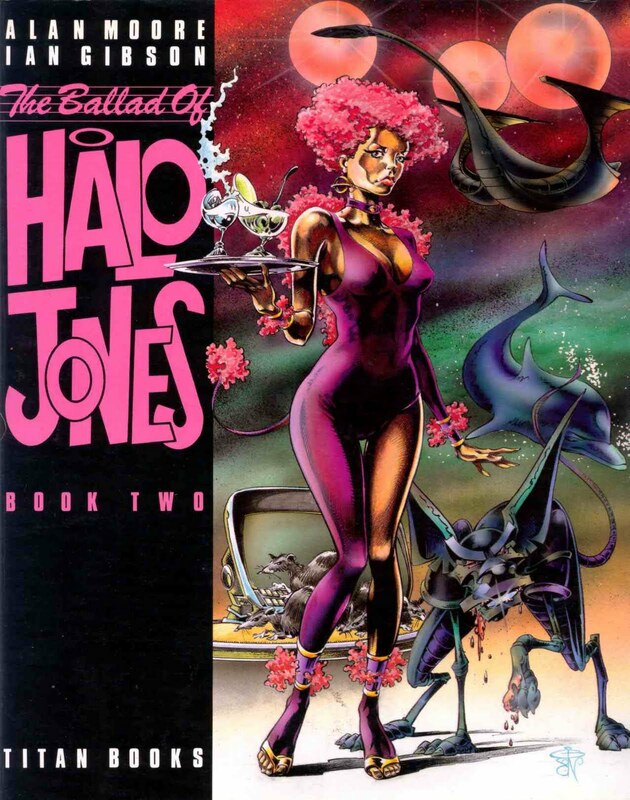 The protagonist of the ‘Ballad’ was the eponymous Halo Jones, a teenage girl living in ‘The Hoop’, a vast ring-shaped habitat moored in the Atlantic Ocean off the eastern coast of North America, joined by a bridge to the tip of Manhattan Island. In effect a huge ghetto for the unemployed and unemployable the Hoop was where the ‘Allied Municipalities of America’ dumped the rejects of its society, dubbing them ‘Increased Leisure Citizens’, leaving them survive on a meagre system of state-provided credits. Blighted by poverty and crime, and with a disruptive population of alien immigrants from Proxima and Alpha Centauri displaced by the great interstellar war that looms menacingly in the background of the first two books, the Hoop was a no-man’s land where even the ‘Rumblejacks’, the local police force largely made up of lobotomised ex-convicts, were little more than another criminal enterprise. The only real escape from this slum for those who became too depressed by life to carry on was through the state-sponsored program of free euthanasia. In a surprisingly tight and linear storyline taking place over just one day, a serious of increasingly disastrous and often tragicomic misadventures resulted in Halo losing her two best friends, one to a bizarre, brain-washing cult and the other to an unexplained murder. Broken-hearted and despairing of life in the Hoop she decided to emigrate from the planet Earth along with ‘Toby’, the pet robotic dog she inherited from her slain friend, by securing a place as a hostess on the luxury space liner, the ‘Clara Pandy’. Told in serial form over several issues of 2000AD in 1984 this first sequence formed ‘The Ballad of Halo Jones Book 1’ and was an instant hit with fans who appreciated Moore’s refreshing take on what was otherwise familiar Sc-Fi fare and as well as the wonderful artwork of Gibson, whose attractively drawn Halo Jones became a veritable love-object for many readers. The next year saw the publication in serialized form again of ‘The Ballad Of Halo Jones Book 2’, which lived up to the high promise of the first series, with a clever and quiet poignant prologue story presenting Halo as a celebrated figure to future generations. Here she was now working as a stewardess on a year-long space voyage on the Clara Pandy, where she encountered the mysterious dolphins, which would eventually run the Earth, and the terrifying ‘King Rat’, a type of super-weapon designed to win the on-going Galactic war. She also discovered that it was the robot dog Toby who was responsible for the death of her flatmate making for a startling confrontation in a compellingly well-drawn strip. In 1986 ‘The Ballad of Halo Jones Book 3’ saw the storyline taking a far darker and at times hauntingly effective turn. Set ten years after Book 2, Halo had lived a nomadic, aimless life passing from job to job, eventually becoming a soldier fighting in the forces of the Earth in the interstellar war, where her active service ultimately took her to the very heart of the conflict on the planet ‘Moab’. There a bloody counter-insurgency campaign was being waged against its inhabitants, and where she was courted by the fearsome-looking ‘General Luiz Cannibal’. The series ended with a cessation of hostilities, after which Halo commandeered a spaceship and fled into space, determined to take charge of her life again. And so ended the adventures of one of the most celebrated and well-regarded heroines in the history of comics. While several more books in the Ballad were planned by the creators the story never got beyond the third instalment as it became bogged down in a quagmire of legal, financial and personal disputes that left it in a sort of limbo from which it never recovered. From the very first instalment praised for it the quality of its writing, and the fantastic creativity of Gibson’s artwork, the legend of the comic book serial Halo Jones only grew with the telling, as each series carried forward not just the storyline, but surpassed what came before. Coming to a premature halt in 1986, and with the promise of more never to be fulfilled, it has remained one of the great what-if series of the comics’ genre, as fans and critics alike wondered and projected from every scrap or rumour by the makers or copyright owners about where it might have progressed. Repeated demands for ‘more’ have never been fulfilled – and perhaps rightly so. Halo Jones was of its time: youthful, angry, rebellious, it raised the bar in comic writing and artwork to new, adult levels long before the age of graphic novels proper. Halo herself became one of the endearing symbols of the rejection of conformity or convention. She was the intellectual comic hero, her martial antics taking second place to the intensely personal journey her life became in the three published books of her adventures. Rarely equalled, she remains the quintessential female anti-hero, tired, grumpy, draggle-haired Halo, with her white punk hair, and tight tee-shirts, world-weary before her time and searching always, for something more. The original of this review appears in Prog464.com.